Our friend Rith takes us home to his village, where his auntie cooks soup in a dimly lit kitchen, black from years of use. Little rays of sunlight beam through tiny pinholes in the ceiling. Her thick tamarind cutting board sits on a slat bed, where she chops scallions, basil, culantro and lime. 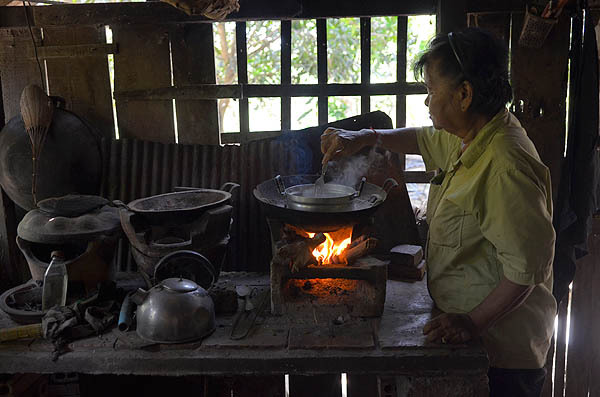 Her pot sits atop a wood-fired stove, bubbling and steaming, as the room grows hotter. Inside the pot are fragrant sticks of lemongrass. She’s making sour fishhead soup with herbs from the plentiful garden. “We are organic,” says Rith, who also runs an English-language school on the grounds (organic growing is part of the lesson plan here). Healthy chickens scamper about while a handsome black cat prowls the yard. Mango trees sag with the weight of their fruits. The air outside smells fresh and flowery. The air inside smells rich and lemony. 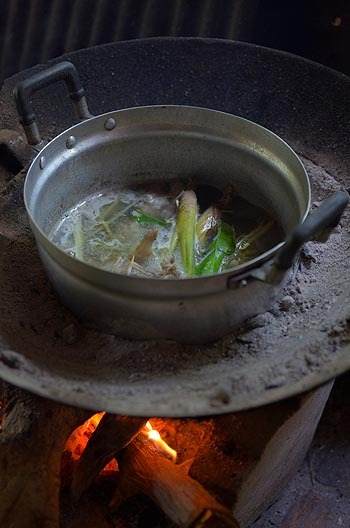 This soup is called sngao chrouk k’bal trei. The “chrouk” in this name sounds to my ears an awful lot like “ch’hrouk,” which means pork. But it’s not at all the same. This beautifully complex language of 33 consonants, 23 vowels and 60 vowel sounds (with infinite possibilities for transliteration) can lead to dangerous ear strain. Or utter confusion. (Long ago, much to the entertainment of the Khmers around us, we made the repeated mistake of asking for no farts in our rice… when we meant no egg.) Here, “chrouk” signifies the wonderful sour mix of chopped herbs that create deliciously fresh and fragrant soups. Boil the lemongrass. Add the herbs (chopped with a souring agent such as lime or green mango), the fish and salt. And you have chrouk without the pork. You’ll find versions of this, with different types of herbs, all across the country.